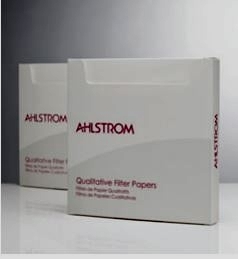 Ahlstrom�s qualitative grades of filter paper are by definition recommended for use in analytical methods which determine or identify particulate constituents of a mixture irrespective of the amount present. Qualitative filter papers are often used in routine separation work that still requires high purity and consistent performance. Ahlstrom offers a complete range of low ash filter papers for general laboratory work that provides you with the correct combination of particle retention filtration speed loading capacity and wet-strength. All our qualitative grades consist of > 95% super refined α-cellulose and linter fibers.